and the brute by instinct. This week will be a continuation of the explorations of social consciousness offered by last weekend’s New Moon in Libra. Overall the feeling this week will remain quite graceful, but there will be some significant squares to the sign of Libra, offering opportunities to use the scales to weigh both sides of a conflict and find balance between opposing forces. In other words, this week will enable you to practice of the art of judicious thinking and decisive action. Philosophy is fundamentally supposed to give one the skills necessary to explore matters of good and evil, to question one’s actions, and ultimately allow one to make wise decisions. This fundamental philosophical purpose is in alignment with the themes of Jupiter in Libra, which will be in this sign for the next 12 months. This week, with the Sun and Jupiter in Libra promoting high-minded and graceful responses to life’s inherent chaos, the timeless writings of Cicero can offer much inspiration. Marcus Tullius Cicero was born on January 3, 106 B.C. and (like so many great philosophers) he was murdered on December 7, 43 B.C. 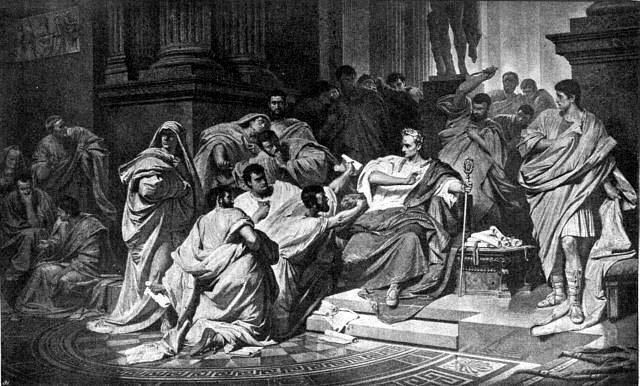 for publicly opposing Marc Antony in the Senate the year following Julius Caesar’s murder. From an historical perspective, Cicero’s life and death serve as poignant symbols for the decline and fall of the Roman Empire. Cicero’s popularity and influence through the power of speech and writing was exactly why he was murdered. But, like Julius Caesar, Cicero’s influence remained intact long after his death. For many centuries, Western Europeans were only considered educated if they knew Latin and the main reason to learn Latin was in order to become well-versed in the writings of Cicero: the shining example of perfection in the written word. Thus, even if Cicero has fallen out of fashion in our industrialized technocratic society, his philosophical influence still resounds. Cicero’s kinship with Socrates as a deep questioner allowed him to remain distant from over-identification with the more dogmatic schools of thought in his time. Thus, Cicero was neither an Epicurean nor a Stoic. He thought for himself, questioned authority and inspired others to do the same for the next 20 centuries. To sum up Cicero’s work in a short article is impossible, but essentially Cicero was concerned with following ethics that were interpreted from the language of natural law. Cicero’s Reason was a notion of “following nature” and doing what is “right according to nature.” He emphatically believed in a divine source for this law of nature and believed humankind to be imbued with that sense of natural law and divine source. This sense could be nurtured into reason and virtue, like a seed nurtured into a fruit bearing tree. Therefore, Cicero’s idea of justice was based upon holding every civil law and ruling to the standard of nature’s law. 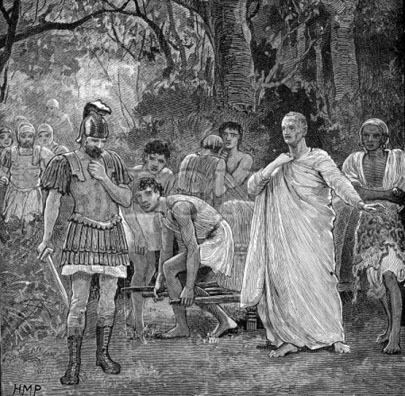 Cicero experimented with responsive answers and actions to this problem for the remainder of his life, ultimately ending up murdered because of his decision to follow the law of nature rather than the pressures of politics. Big questions of loyalty and correct action such as these arrive in everyone’s life at some point. These are questions that require you to use the scales of justice in conjunction with your attunement to the laws of nature, rather than the laws dictated by political motives. Cicero did not believe that one should follow prescribed laws if they were judged to be created from ignorance. Use this week in the season of Libra to re-calibrate and revitalize your own sense of moral equilibrium which is derived from your primal connection to nature itself. Ignore societal fashions and search your own soul for the right answer to your problems. At the beginning of the week, the Sun in Libra will be in a supportive sextile with Saturn in Sagittarius. Here is an aspect that describes gracefully embracing a responsible duty. Thus you can make a lot of progress towards coming into harmony with something that once represented great conflict. You can also demonstrate great determination and skill, inspiring those less knowledgeable than yourself to improve their own strategies for finding accomplishment. Likewise, this will be a period where you will learn a great deal from someone worthy of your respect. The hard work that Saturn always inspires will feel purposeful and lit up by your connection to natural law. On Wednesday, Venus in Scorpio will sextile Pluto in Capricorn intensifying your attraction to power and glory. With respect to your highest ideals of love, this can be very strengthening to your relationships and to your life’s raison d’être. But approached with reckless abandon, this can represent a submission to base desires, manipulation and obsession. Mars in Capricorn will also make a tense square to Jupiter in Libra in the middle of the week, offering necessary adversarial testing of your ability to find ethical equilibrium and maintain adherence to universal law. Imagine this square, not as a brutal attack, but as a passionate debate. If you are prepared for the debate, the adversity will be feel like a sharpening of your many creative and intellectual blades. If you are taken by surprise, any perceived disruption to your world-view may seem cruel and unusual. However you respond, there will be such an immense force of potential energy to draw upon! Do what you can to channel your immense feeling and motivation into developing something you deem to be virtuous, and therefore long-lasting. Examine what you are prioritizing as essential in your life right now and use the rush of Mars and Jupiter to determine what level of virtue your current priorities represent. This process requires a perfect balance of social intelligence and self-possessed internal wisdom. Let neither usurp the other when contemplating things of great importance. On Friday, the Sun in Libra will be squared by Pluto in Capricorn, once again challenging the scales to find balance between light and dark. This is an aspect that will challenge you to go beyond platitudes and learn to say what you mean and mean what you say. The Sun squared Pluto brings necessary conflict with authority. It reveals corruption and abuse. It summons the shadows and asks you to become stronger in response to apparent danger. On the same day, Mercury will enter into Libra, joining the Sun and Jupiter in this planetary collaboration to instill equanimity and balance. But with Mars still squaring Jupiter in the background, the foreground will certainly test the scales of justice by opening up a dialogue about injustice. Mercury, now speaking as the consummate diplomat, will be required to use all the powers of charm and grace to find the middle path over the weekend. If you are prepared to defend and submit to opposition in an improvisational flow that is focused on making peace, this weekend will feel like an extraordinary intellectual exercise. A lawyer by profession, Cicero was forced to confront the rise of a tyrant in his time which forced him to lose respect for the laws of Rome. When the Sun is squared by Pluto, you may be forced to face a hideous truth about that which you ideally would like to have respect for. Thus, you may be called to do a lot of careful reasoning this weekend, that is inspired by your most genuine and devotional morals and ethics. If humans really are born with the capacity for reason, then such opportunities to develop and cultivate that gift should be cherished. It is time to decide for yourself about something which has long been left to mindless rhetoric and public opinion. It is time to be fair to yourself and determine what it is you can tolerate and what you can not.